Another Creepy Vegas HOA - Neighbors at War! Las Vegas homeowners are lucky in one respect: They have Darcy Spears of KTNV-TV, who does frequent investigative reports under the “HOA Hall of Shame” moniker. 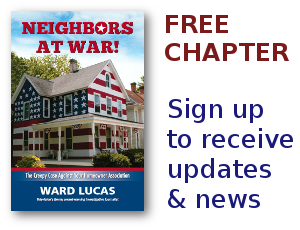 Her latest report involves a dysfunctional HOA called the First Light Homeowners Association. The board of First Light is apparently somewhat vicious to many individual homeowners. They hate the spying, the discrimination, the retaliation, the indiscriminate towing of cars. People are afraid to go home. They’re afraid to open their mailboxes because of the threats, the fines, the foreclosures. I should also mention the massive decline of property values in Las Vegas Homeowners Associations. First Light is a neighborhood you might not enjoy living in. Another Crook Bites The Dust! When Will These Useful Idiots Ever Learn?